Microsite Masters allows you to stay ahead of the SEO curve with a truly intelligent rank tracker that lets you see the whole picture. 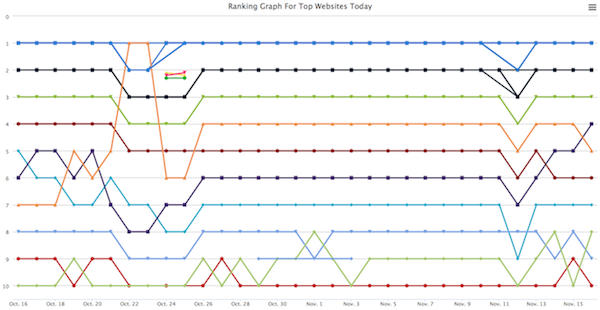 Daily rank tracking for SEO campaigns across multiple search engines. Develop new strategies with ease, reduce costs, and eliminate "trial and error" methodologies with our advanced campaign management tools. Sometimes just knowing where your site ranks is not enough. Microsite Masters lets you view your site's rankings, but also where every other site ranks for each keyword you track, allowing you to spot Google updates, track your competitors and do ORM with ease. Our SEO Scoreboard shows you all of the big movers and shakers in one clear screen, so you can at a glance instantly know what changes happened and what you need to pay attention to. The real reason we care about rankings are because of the traffic and revenue that they bring. With Analytics and Clicky integration you can not only view your rankings but see which rankings lead to increased traffic and revenue. Keep vendors honest while understanding the cause and effects of actions and SERP changes across multiple keyword sets and domains. Share results publically to show SERP movements while keeping campaign sensitive data private. Tailor your results to a specific city or zipcode to get the most accurate rankings right where they matter. Local Rank tracking is critical for small businesses because it helps them rank their pages where it counts. Measure the SERP impacts of your actions (link building, content creation, etc.) with respect to vendors, pricing, and time. Managing clients? Providing SEO Services? Use automation and accountability to your advantage! I love how the Microsite Masters interface is easy to use and navigate. I track 25,000 keywords with them and I'm fortunate that they don't count duplicate keywords as I'd be way over that considering I track tons of the same keywords. This is because once I find profitable keywords I attack them with multiple websites; and I also run multiple test sites for keyword groups to keep the keyword variable constant. I also love how they track the history of any keyword that is being tracked in MSM...not just of your website but of the top 20 websites for that keyword. 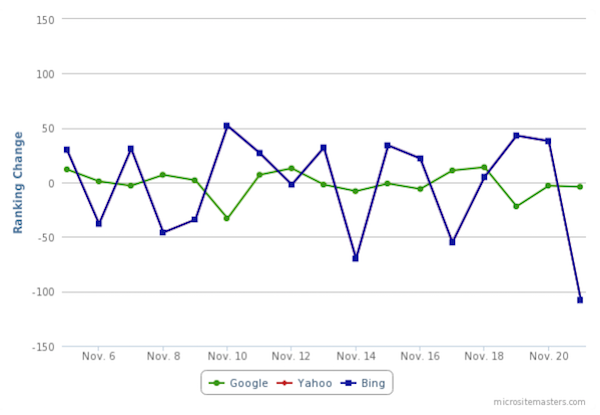 This is HUGELY beneficial for analyzing, tracking, and figuring out changes going on with the search engines. The thing I like the most about Microsite Masters is how accurate it is. I track most all of my rankings in Google Brazil, so I needed to find a reliable tracker for Google BR. It was proving to be a hard task, until I found Microsite Masters. All the products and services I tried before were unable to track rankings with precision for Google Brazil. Microsite Masters was the only one that worked fine. The pricing was also fair, so to me it was a no brainer. As an SEO agency, there is nothing worse than reporting inaccurate data to your clients. I include a ranking report for my clients in my monthly reporting package. Until recently, I would have clients coming back saying, “You have my position wrong.” Not exactly a credibility builder... I was fortunate enough to test MSM rank tracker and although very skeptical at first, I decided for the first time IN A LONG TIME to begin migrating all my sites into this platform. I made that decision years ago because the ACCURACY caught my eye and I never looked back. About two months ago I was doing some SERP tracking accuracy testing. I tracked 100 KWs and then manually searched for them through proxies and recorded their actual positions VS reported positions. Microsite Masters was by far the best of the tools with a virtually zero error rate! I've tried several ranktracking services in the past couple of years, but nothing out there comes close to being as powerful or feature-rich as MicrositeMasters. 10/10... Sets a huge new standard for rank tracking services.